This craft is about the story of Abraham sharing the land with his nephew, Lot. It will help children take home what they have learned from the story about sharing and encourage them to begin sharing more with those around them. 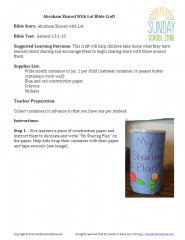 Teacher Preparation: Collect containers in advance so that you have one per student. Step 1. 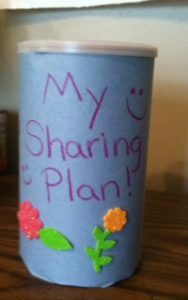 Give learners a piece of construction paper and instruct them to decorate and write “My Sharing Plan” on the paper. Help kids wrap their container with their paper and tape securely (see image). Step 2. Give children sheets of red and blue construction paper. 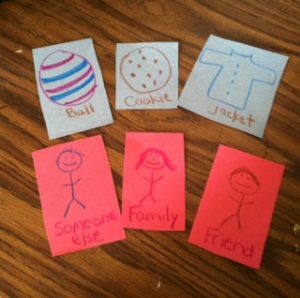 On the red sheets, instruct learners to draw pictures of three things they could share with someone, including some kind of food, a piece of clothing, and a toy. On the blue sheets kids should draw three people, including a family member, a friend, and someone else. Instruct learners to cut out the six images (see image). Encourage children to fold the pictures and use their sharing plan jar during the next week by choosing a red and blue paper from the jar. Match the thing with the person and start sharing!